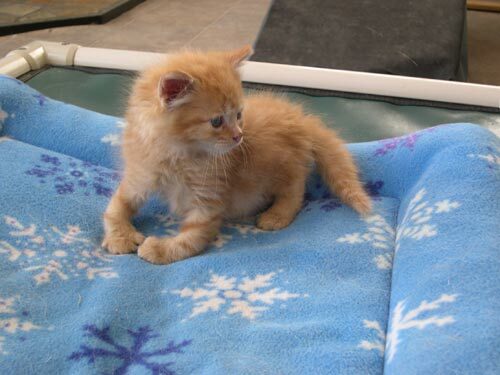 This little tyke was dumped in Spokane Animal Control’s overnight bin at 3 weeks of age. 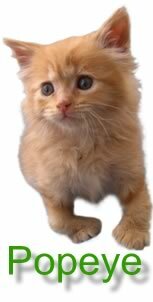 His front legs were bent, with the paws turning inward. 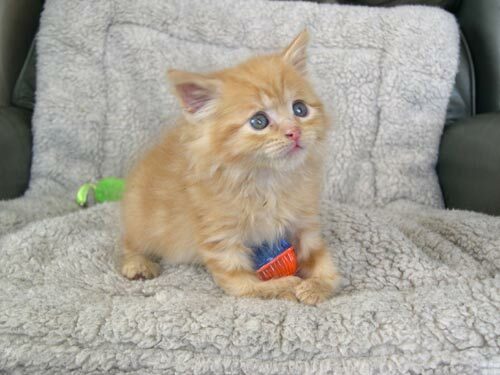 Since the rest of his littermates weren’t dumped along with him, we assume he came from a breeder who wanted to quickly hide the “defective” kitten. His legs look beefy when he walks, which is why we named him Popeye. Our vets diagnosed his condition as a ‘vagus deformity’: Two bones in each leg are growing at different rates. After consulting with a veterinary radiologist and a surgeon in Spokane, our vets concluded that the best course of action right now was not to intervene surgically but see how his front legs continued to develop. For his first few weeks here, Popeye longed for his momma, so he “adopted” another recent arrival, Clancy the old, deaf dog. 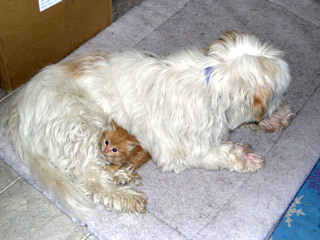 Popeye thought Clancy made a wonderful substitute Mom and spent most days curled up in Clancy’s long fur. See a photo of the two of them?here. Warning: Do not feel sorry for him! Behind that sad-looking face lurks a tiny tyrant! He meows non-stop until he gets what he wants. He knows he’s irresistible and plays it to maximum effect. 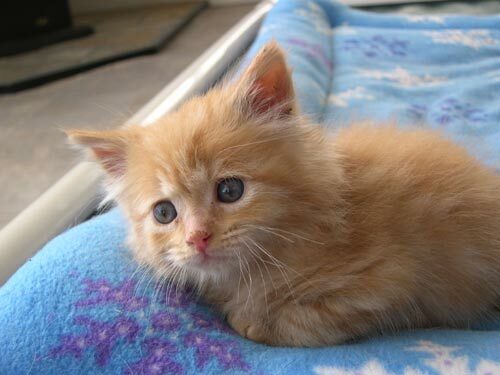 Popeye can run, climb and jump as fast as any kitten we’ve seen. He is also fearless? when the dogs lower their faces down to his level, he promptly starts pummeling them on the nose with his tiny paws. When Popeye grows up, we’ve got trouble! For an update on Popeye,?click here.